Queen Elizabeth II celebrated her 85th birthday today with a commemoration that mingled an important tradition of the Easter season in Great Britain with the real birthday of the oldest British monarch ever to occupy the throne. Elizabeth was born on April 21, 1926, at the London home of her maternal grandfather, the fourteenth Earl of Strathmore and Kinghorne. Today, with just a week and a day to go until the wedding of the queen’s grandson Prince William to Catherine Middleton, the monarch attended Maundy Thursday service at Westminster Abbey on her birthday. She gave “Maundy money,” specially minted silver coins, to 85 men and 85 women, the number representing the years of her life. The recipients were retirees chosen for their “tireless work for the Church and their communities,” according to an article in The Telegraph. The custom, which draws from the explicit example of humility and service Jesus gave his apostles by washing their feet at the Last Supper, is hundreds of years old in England. It replaced an earlier practice in which the king would wash the feet of the poor on Maundy, or Holy, Thursday. However, British monarchs had drifted away from distributing Maundy money personally, leaving the task to the clergy, until George V, Elizabeth’s grandfather, revived the tradition in 1932, according to an article that year in Time magazine. Queen Elizabeth ascended to the throne when she was 25, and has ruled for 59 years. In 2007, she passed “mad” King George III, who died in 1820 at the age of 82, to become the oldest British monarch. Only Queen Victoria has had a longer reign. 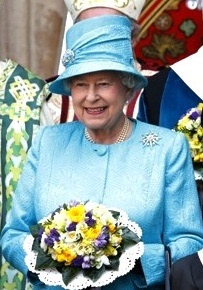 The queen celebrates her birthday officially in June. This entry was posted in A world view, History and tagged British monarchy, Catherine Middleton, Earl of Strathmore and Kinghorne, London, Maundy Thursday, Prince William, Queen Elizabeth II, Westminster Abbey by Delia. Bookmark the permalink.